Metric Boards are used to display a set of related metrics. As with all Metric features, Metric Boards include an element of discovery. Metric Boards are highly flexible, empowering you to create unique displays tailored to your specific needs and audience. This flexibility enables you to mold your data to effectively inform others and illustrate progress toward your business goals. A diverse set of configuration options means you can individualize each Metric Board display. When interacting with a Metric Board, available options depend on whether you are in View mode or Edit mode. Click the + beside Metric Boards and enter a name for the Metric Board by selecting the text in the title text field and typing a name. Under Metric Boards, select the Metric Board you want to delete. Click the 3-dot menu in the upper-right corner of the Metric Board and click Delete. View mode enables you to set personal options for your Metric Board. The customizations you make while in View mode persist locally and are only visible to you. If you want to make permanent changes to a metric on your Metric Board, you need to be in Edit mode. Share the Metric Board. Learn more about sharing here. Revert back to the original, pre-personalization settings for the Metric Board and, by association, all of its metrics. This reset only impacts your view of the metrics and the Metric Board. Select the date range and dimensions by which to filter all metrics on the Metric Board (by selecting an option from the drop-down lists at the top of the Metric Board). Personalize - Here you can modify a range of options, such as, choosing to break lines for blank values, selecting an alternate aggregation method, and comparing your data to a previous time period. Personalization changes persist locally and are only visible to you. For more detailed information on metric settings, see the Edit mode section below and this Knowledge Base article. Go to (name of the metric) - Navigate to the metric's Explore View page. Expand/Collapse - Interact with and personalize your metrics while in full-screen mode. Once one metric is expanded, you can navigate between all of the metrics on a Metric Board. Personalization and other options are accessed from the expanded metric’s 3-dot menu. When you’re done exploring, click the button to collapse the metric and return to your Metric Board. Add to Metric Board - Add the metric to an existing or new Metric Board. About - Display information about the metric, including its name (if you click the link beside Name, you open the metric in its Explore view) and owner, the date it was last modified and refreshed, and a definition (if it was created using one the metrics from our Metric Hub). Edit mode is used for authoring and editing Metric Boards for you and your team. When you make changes in Edit mode, you are setting the default display that everyone will see when viewing the Metric Board and its metrics. Edit mode options range from simple modifications, like adding metrics to and removing metrics from a Metric Board and modifying the Metric Board layout, to more integral edits, such as selecting an alternate date range, choosing a different visualization type, and viewing cumulative data and trend lines. When you add a Metric Board, you enter in Edit mode, where you can interactively make adjustments to your Metric Board and each of its metrics. To enter Edit mode for an existing Metric Board, click the Edit button in the upper-right corner of the Metric Board. You can edit Metric Boards that you created and Metric Boards that have been shared with you (if you are granted Edit access). Your edits only take effect after you click “Save”. After saving, changes are reflected in everyone’s view of the Metric Board when they refresh their web page. Each Metric Board can display up to 12 metrics. You can add metrics to Metric Boards (in the Metric Monitoring area of Klipfolio) and to dashboards (in the Custom Dashboard area of Klipfolio). In Metric Monitoring, with the Metric Board open, click the Edit button in the upper-right corner. Click the button in the upper-right corner of the Metric Board and select a metric from the list. To add more metrics to the Metric Board, repeat step 2. When you’re done adding metrics, click Save. Note: You can also add a metric to a Metric Board from the metric's Explore View page by clicking the 3-dot menu beside the metric's name and then clicking Add to Metric Board. In Custom Dashboards, with the dashboard open, click the button. 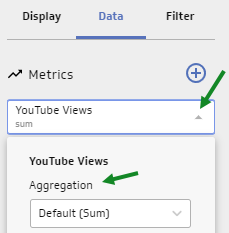 Note: You can also add a metric to a dashboard from the metric's Explore View page by clicking the 3-dot menu beside the metric's name and then clicking Add to Dashboard. With the Metric Board open, click the Edit button in the upper-right corner. On the metric tile, click the 3-dot menu and select Remove. In Custom Dashboards, with the dashboard open, click the 3-dot menu for the metric and select Remove from Dashboard. You can modify your Metric Board display by resizing individual metrics and reordering their position on the Metric Board. With the Metric Board open, click the Edit button in the upper-right corner of the Metric Board. Click and drag the bottom-right corner of a metric to resize it. Click and drag a metric to change its position on the Metric Board. There are a couple of configuration options you set at the Metric Board level. The settings you choose for the date range and filtering options will apply by default to all metrics on the Metric Board, however, viewers of the Metric Board can optionally make changes to those settings. You can also add the filter control to the Metric Board, without making any selections, enabling viewers to create their own. If you modify the filters and want to return to the Metric Board’s original settings, click the 3-dot menu for the Metric Board and select Revert. Note that this action also resets all personalization settings you applied to the metrics on the Metric Board. Select from the drop-down list at the top of the Metric Board. Click the Filter button and select the dimensions you want to display on your Metric Board. Click the dimension's drop-down arrow. Select the members you want to display. If there are a lot of members in your metric, use the Search feature to find them. 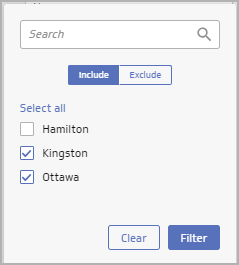 Note: For narrow browser windows, click the right-pointing arrow, beside "x filters applied", to view and modify your list of applied filters. To configure an individual metric, click its 3-dot menu and select Configure. This opens its configuration panel. Either display a continuous line or break lines when there are gaps in data. Select a date range. The Use Metric Board date range option is selected by default and applies the date range as set at the Metric Board level. You can optionally select Custom to set a unique date range for a metric. Select an alternate aggregation method. Choose to view your data cumulatively. Choose the dimension(s) by which you want to segment your data. Choose the time periodicity for the metric, for example, hourly, daily, or weekly. Choose to add a trend line. Choose to either apply no comparison or to compare your data to a previous period. Filter your data by selecting the members to include for each dimension. For more detailed information on metric configuration settings, see Exploring a metric. What's the difference between a dashboard and a Metric Board?